2003 edition of JFK book, published by Harper-Collins. 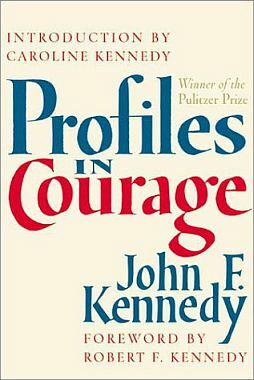 Profiles in Courage is the name of a Pulitzer Prize- winning book by former U.S. President John F. Kennedy written in 1954 and 1955 while he was a U.S. Senator. The book chronicles acts of bravery and integrity in the careers of eight U.S. Senators in American history. Profiles in Courage became a best-seller and was ground-breaking in its day, becoming one of the first books used to advance a political career aimed at the White House. Yet apart from its politics, Profiles in Courage remains popular, not only for its attachment to the Kennedy legacy, but also as an important book on political courage and U.S. Senate history. Sometimes forgotten is the fact that Kennedy’s book also spawned a Peabody Award-winning television series in 1964. Profiles in Courage also had numerous print runs including a 50th anniversary edition in 2004, inspired several new books and ongoing research on the history of political courage, and also led to the creation of the “Profiles in Courage” award, given annually since 1990. “Jack” Kennedy was first elected to the U.S. House of Representatives in 1946 as a Congressman from Massachusetts. He was 29 years old at the time. In 1952, he ran for and won a U.S. Senate seat. However, as a freshman Senator in 1954 and 1955, Kennedy took leave from the Senate to recover from surgery to treat a perennial back problem. It was during this period that he undertook Profiles in Courage. In the book, the senators that Kennedy profiled were mavericks of a kind who took courageous stands or stood apart from the safe and conventional norms of their day. They crossed party lines, defied their constituents, or ran counter to public opinion to do what they felt was right. Among Kennedy’s featured senators were: John Quincy Adams, Daniel Webster, Thomas Hart Benton, Sam Houston, Edmund G. Ross, Lucius Lamar, George Norris, and Robert A. Taft. Each of these, and others Kennedy mentions in his book, suffered severe criticism and losses in popularity because of the particular stance or action each took, which was the point of Kennedy’s “courage” argument. Early paperback edition of JFK book. By the late fall of 1955, advance notice of the book’s publication began appearing in some national newspapers. Kennedy himself also penned a long piece in the New York Times Magazine in December 1955 that previewed the book’s themes. On Sunday, January 1st, 1956, the book was reviewed on the front page of the New York Times Book Review along with a large photo of Kennedy. Cabell Philips, the reviewer, noting that politicians themselves often criticized their own profession, wrote: “it is refreshing and enlightening to have a first rate politician write a thoughtful and persuasive book about political integrity.” Profiles in Courage generally received good reviews and was widely acclaimed. It became a best seller and remained on the best-sellers’ list for some 95 weeks. The book gave Kennedy a certain political gravitas and national recognition he did not have before, lifting him from the ranks of unknown senators. And the book’s arrival was well-timed too, as 1956 was a presidential election year; a time when national political campaigns were in full swing. The book gave Kennedy a certain political gravitas and national recognition he did not have before, lifting him from the ranks of unknown senators. JFK VP campaign button at the 1956 Democratic Convention tagging him a 'Profile in Courage'. Kennedy featured on Time cover, Dec 2, 1957, with cover story, 'Democrat's Man Out Front'. In 1957, following the election, Kennedy began his unofficial campaign for the White House as he continued his duties in the U.S. Senate. Among fellow Democrats in the Senate who were also presidential contenders at the time were Lyndon Johnson and Hubert Humphrey. Profiles in Courage, meanwhile, returned to the news in May 1957 as the book picked up a Pulitzer prize. The award came as something of surprise, however, as the Pulitzer board rejected the jury nominations and gave the prize instead to Kennedy’s book. In fact, a few critics charged that Kennedy’s father had been involved behind the scenes on his son’s behalf. New York Times columnist Arthur Krock, a friend of Joe Kennedy’s, boasted that he had lobbied hard for the Kennedy book. But no evidence of impropriety was found. Through 1957, Kennedy continued to travel the country, with numerous speaking engagements. 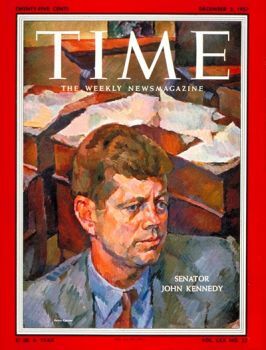 He appeared on the cover of Time magazine’s December 2nd, 1957 issue, with the feature story, “Democrat’s Man Out Front.” About that time, however, some charges surfaced challenging Kennedy’s authorship of Profiles in Courage. John Kennedy, before he entered politics, had aspired briefly to a career in journalism and had written on history and public policy. As a student at Harvard in the 1930s, Kennedy had studied international relations and history. In his senior year, he wrote a college thesis that examined the failures of the British government to take steps to prevent World War II, entitled “Appeasement in Munich.” Kennedy’s paper did not castigate Britain’s appeasement policy, and suggested that an earlier confrontation between the U.K. and Nazi Germany might have been more disastrous in the long run. That paper was written in the spring of 1940. Kennedy’s father, Joseph P. Kennedy, Sr., looking out for his son’s political future, was able to get that senior thesis paper released from Harvard and had it published as a book. Joseph Kennedy, as ambassador to Britain, had supported Prime Minister Neville Chamberlain’s policy of appeasement during the late 1930s, which many believe cost the senior Kennedy his own political career. At any rate, John Kennedy graduated from Harvard with a degree in international affairs in June 1940. A month later, his thesis was published by Willard Funk, Inc., in New York in July 1940 as Why England Slept – a play on Winston Churchill’s 1938 title, While England Slept, which also examined the buildup of German power. Although there has been a long running dispute over how much of Profiles in Courage Jack Kennedy actually wrote, it does appear that he formulated the idea, wrote a number of memos on the project, did oversee the book’s structure and production, and did write and/or dictate much of it. Wife Jacqueline also appears to have contributed to the concept for the book, and helped engage the research and writing assistance of a history professor at Georgetown University named Jules Davids, whom she had met taking his history course. Library of Congress researchers also assisted Kennedy, as they would any Senator requesting background research from the Library. But because of his back problem – according to one of Kennedy’s secretaries at the time, Gloria Sitrin – Kennedy could not sit for long periods of time writing or typing, and instead, dictated much of the material. Still, Ted Sorensen, Kennedy’s assistant, is believed by many to have written at least some of the book, while others say he only provided research and constructive editing. In any case, in the final book, Kennedy acknowledged all of these participants and contributors. On December 7, 1957, syndicated columnist Drew Pearson, interviewed on TV by Mike Wallace, said the book was ghostwritten for Kennedy, suggesting that Kennedy’s aide, Ted Sorensen, had written much of the book. Kennedy did not take kindly to the charge and hired lawyer Clark Clifford, who produced Kennedy’s handwritten notes and statements from people saying they had seen Kennedy working on the book. Sorenson also denied the allegation and signed an affidavit attesting to Kennedy’s authorship. Kennedy had acknowledged Sorensen’s involvement in the book, crediting him in the preface and also acknowledging other contributions. Kennedy and Sorensen insisted that Kennedy was the book’s author and the initial controversy died down, although it would emerge again years later. Kennedy, meanwhile, was re-elected to a second term in the U. S. Senate in 1958 by a wide margin, and continued to draw national attention through the Democratic primaries as the front runner for the White House. In January 1960, he formally declared his bid for the Presidency. During the campaign, and after Kennedy won the election, there was continuing interest in Profiles in Courage. By the time of Kennedy’s Presidential inauguration in January 1961, the book was being prepared for sale as a Pocket Books paperback. A young reader’s edition was also produced in March 1961. By then, Profiles in Courage had sold 2 million copies since its original 1956 publication. In June 1963, midway into Kennedy’s presidential term, the television rights for Profiles in Courage were sold for an estimated $3.5 million (1963 dollars). The NBC television network planned to film and air a series of 26 hour-long TV programs based on the book. 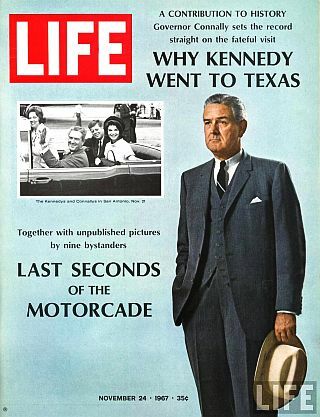 Several months later, however, national tragedy came with the president’s assassination in Texas in late November 1963. After Kennedy’s assassination, Harper & Row was besieged for copies of Profiles in Courage, with orders in excess of 10,000 copies by late November. A Perennial Library Memorial Edition of Profiles in Courage was prepared by Harper for 1964, which included a moving introduction by Kennedy’s brother and then U.S. Attorney General, Robert Kennedy. Front-page New York Times story on the sale of JKF book for TV series, June 10, 1963. The following year, in mid-November, the planned NBC television series, ”Profiles in Courage,” began airing on Sunday evenings. However, with 26 episodes, additional characters beyond those in Kennedy’s book were needed for the series. All of the additional characters subsequently profiled in the TV series had been previously approved by JFK. The producer of the TV show, Robert Saudek, was known for his serious television productions, and had also produced the much-praised OmnibusTV series as well as concerts by the New York Philharmonic. Saudek had a clear grasp of Kennedy’s message for the Profiles TV series. One of the additional historic politicians, for example, was that of Oscar Underwood, an Alabama Senator who in 1924 was in the running for the Democratic presidential nomination. Underwood, however, chose to condemn the Ku Klux Klan, losing southern support, thereby ruining his chances of winning the nomination and later losing his Senate seat and his political career. Aired on NBC, Sundays, 6:30-7:30pm. Time magazine called the Profiles in Courage TV series “a bracing antidote to the plethora of two- dimensional tele- dramas in which tinsel laurels automatically crown the good guy.” The TV series ended in mid-1965, but received a Peabody Award for “distinguished and meritorious public service rendered by radio and television.” The book, meanwhile, remained in print and continued to be used in schools and beyond. 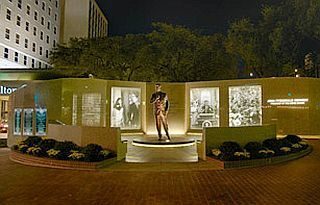 The Profiles in Courage legacy, however, continued through the remainder of the 20th century and into the 21st Century. In 1989, the John F. Kennedy Library Foundation established an award for political courage called “The Profile in Courage Award.” The annual award is made to recognize displays of political and moral courage similar to those that Kennedy originally wrote about in his book. It is given to individuals, and often elected officials, who have risked their careers or lives by pursuing a larger vision of the national, state, or local interest in opposition to popular opinion or pressure from constituents or other interests. Winners are selected by a bi-partisan committee named by the John F. Kennedy Library Foundation, which typically includes members of the Kennedy family as well as other prominent Americans. The award is generally made around the time of JFK’s birthday, May 29th. From the early 1990s, the award has been presented at the Kennedy Library in Boston by Kennedy family members, including JFK daughter Caroline Kennedy Schlossberg, the late John F. Kennedy, Jr., and Senator Ted Kennedy. In addition to honoring those with political courage, the award had also helped kindle continuing interest in the original book. 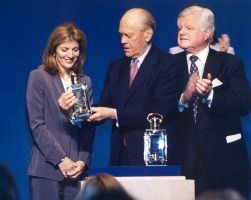 Former President Gerald Ford receiving 2001 Profile in Courage award from Caroline Kennedy & Senator Ted Kennedy. 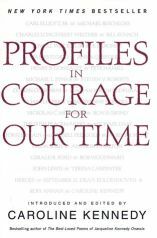 In 2002, Caroline Kennedy gave the “profiles of courage” concept a new focus, teaming up with publisher Hyperion and serving as editor for a new book, Profiles in Courage for Our Time, offering a collection of essays profiling recent winners of the Profile in Courage award. In this book, award winners are profiled by a variety of writers, historians. and journalists, some of well-known stature such as Michael Beschloss, E. J. Dionne, Anna Quindlen, and Bob Woodward. Famous award winners, as well as lesser known recipients, are profiled in the book. Among some of the well-know recipients profiled, for example are: New Jersey Governor James Florio, former U.S. Senator Lowell Weicker, and former president Gerald Ford. Among the less well-known are activists and community heroes such as Corkin Cherubini, Nickolas C. Murnion, and Hilda Solis. 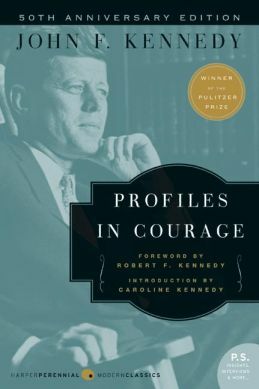 2005 book of essays on Profile of Courage award winners by Caroline Kennedy (ed). In April 2006, a special 50th anniversary edition of Profiles in Courage was published by Harper. This special “P.S.”edition, as the publisher called it, commemorated the 50th anniversary of the book’s publication and also included a number of extras, such as vintage photographs, an extensive JFK biography, Kennedy’s correspondence about the project, reviews of the book, a letter from Ernest Hemingway, and two speeches from recipients of the Profiles in Courage Award. Elsewhere in the Kennedy family, the “heroes theme” was also being explored by Robert F. Kennedy Jr., who with publisher Hyperion in September 2007, launched the first of “Robert F. Kennedy Jr.’s American Heroes Series” of children’s books, Joshua Chamberlain and the American Civil War. A second book in the series, focusing on another Civil War hero, Robert Smalls, a slave who hijacked a Confederate steamer and turned it over to the Union Navy, and later became a U.S. Congressman, will be published by Hyperion in 2008. 50th anniversary trade paperback edition of JFK book issued by Harper-Perennial in 2007. JFK’s Profiles in Courage, meanwhile, compiled quite a track record over more than 50 years. The book has had at least 65 printings, sold more than 3 million copies, and hit the bestsellers list three times: in the late 1950s when JFK was an up-and-coming Senator; after he was elected President in 1960-61; and following his assassination in 1963-64. The book also spawned a successful television series in 1964-65, inspired the annual Profiles in Courage Awards, and sparked new research and subsequent books on political integrity and the history of heroism. 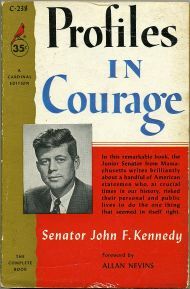 Whatever criticism may still linger about the JFK’s Profiles in Courage, there is no doubt that this book instigated an important concept and way of evaluating political courage, fostered a respectable progeny of good and useful history, and helped bring into the spotlight contemporary careers of exemplary public service and good works. Time magazine cover, November 24th, 1958, featuring seven “Democratic Hopefuls” then believed to be in the early running for their party’s 1960 presidential nomination: at top, Adlai Stevenson, former Illinois Governor and Democratic Presidential candidate (1952 and 1956); standing from left, Senator Hubert H. Humphrey (MN), Senator Stuart Symington (MO), Senator Lyndon B. Johnson (TX); and seated, from left, New Jersey Governor, Robert Meyner, Senator John F. Kennedy (MA), and then California Governor-elect, Edmund "Pat" Brown. John F. Kennedy Presidential Library & Museum, National Archives and Records Administration, Boston, MA. John F. Kennedy, “The Challenge Of Political Courage; A Senator Analyzes the Pressures Confronting the Conscientious Lawmaker,” The New York Times Magazine, Sunday, December 18, 1955, p. 13. Cabell Phillips, “Men Who Dared to Stand Alone; Political Integrity and the Price Paid For It Is Discussed by Senator Kennedy,” The New York Times Book Review, Sunday, January 1, 1956, p.1. Charles Poore, “Books of The Times; Two Who Put Whole Nation First Assaying a Cause Championed,” New York Times, January 7, 1956, Saturday, p. 15. John F. Kennedy, “Search for the Five Greatest Senators,” The New York Times Magazine, April 14, 1957. Harrison E. Salisbury, “O’Neill Play, Kennan Book Awarded Pulitzer Prizes,” New York Times, Tuesday, May 7, 1957, p. 1. “Democrats: Man Out Front,” Cover Story, Time, Monday, December 2, 1957. A.B.C. Answers Pearson; Apologizes for Charge About Kennedy on Wallace Show,” New York Times, Sunday, December 15, 1957, p. 73. Lewis Nichols, “In and Out of Paperbacks,” Book Review, New York Times, January 15, 1961, Sunday, p. BR, A-2. Harry Gilroy, “Publishers Rush President Books; Revised Works on Kennedy and Johnson Planned, Johnson Book Updated, Memorial Editor Set,” New York Times, November 27, 1963, Wednesday, p. 35. “Through a Brother’s Eyes,” Time, Friday, February 21, 1964. Jack Gould, “TV: ‘Profiles in Courage’; First Program Based on Kennedy Book Is Presented on N.B.C.,” New York Times, November 9, 1964. “The Badge of Courage,” Time, Friday, November 20, 1964. “A Year for Teen-Agers,” Time, Friday, May 7, 1965. Robert McG. Thomas, Jr., “Jules Davids Dies at 75; Helped Kennedy With ‘Profiles’ Book,” New York Times, December 12, 1996. Patricia Cohen, “An Old Letter Backs a Claim of Helping Kennedy Write ‘Profiles’,” New York Times, October 18, 1997. Curtis Wilkie, “The Spirit of ’56: Recollections of A Convention Worth Watching,” Boston Globe, July 25, 2004. Joe Queenan, “Ghosts in the Machine,” Books, New York Times, March 20, 2005. Shannon Maughan, “Profiles in Courage: Robert F. Kennedy Jr.’s American Heroes,” Children’s Bookshelf, Publishers Weekly, September 27, 2007. Caroline Kennedy, Profiles in Courage for Our Time, @ Hyperion Books. “The Jack Pack, Pt. 2: 1961-2008,” (Rat Pack & JFK inauguration; years thereafter; etc.,), PopHistoryDig.com, August 21, 2011. “JFK, Pitchman?, 2009″( John F. Kennedy in Omega watch ad), Pop HistoryDig.com, August 29, 2009. 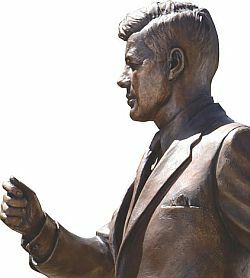 “JFK’s Texas Statue, Ft. Worth: 2012” (statue in Fort Worth, Texas commemorates JFK’s 1960 visit there prior to his assassination), PopHistoryDig.com, April 17, 2013. “RFK in Brooklyn, 1966-1972″(Robert F. Kennedy statue in Brooklyn, urban policy history, etc.,), PopHistoryDig.com, July 20, 2009. “1968 Presidential Race – Democrats”(includes section on RFK campaign), PopHistoryDig.com, August 14, 2008.